Casino Night fundraising should be fun! Although it might seem that way, it’s not just fun and games. There are many decisions to be made, each is imperative to the success of your casino night fundraising event. Every decison is equally important, such as: the perfect event date, time, venue, and location. The critical part is rallying support from your sponsors. Hopefully these tips and this proven strategy will help you put together an amazing and profitable event. Nothing is more important then choosing the perfect calendar day. It’s been my experience, (and I’ve worked with many great charitable organizations), that planning your event (6) months to 1-year in advance is a wise decision. This allows proper time to plan and to deliver a flawless and well-organized event. Casino night fundraising requires having a dedicated team, an outreach plan and plenty of time to structure your event to insure that your funding goal is obtained. Most casino night fundraisers are successfully hosted in the spring, right after Valentine’s Day, through the end of May. Although fundraisers in the fall might be a popular choice, many fail because of scheduling conflicts with football and the Holiday season. If you choose to book your event during fall, be sure to eliminate any event dates that might include regular or playoff high school, college or NFL football and/or dates near the Holidays. If planning for a spring date, be careful of March madness, otherwise you should be good-to-go! Here is a money saving tip – consider hosting your event on a weeknight because many venues and vendors will offer a discounted rate! A casino night fundraiser works well because everyone is excited to be a part of creating an authentic casino experience! That enthusiasm carries forward and helps motivate your team towards obtaining those valued sponsorships! If you follow this sponsor strategy, it should have you ‘in the black’ long before event day! Here’s how it works! – Start by reconciling the amount for each ‘casino table game’ you are renting. Then price and sell those casino table games to your sponsors for slightly more than you paid to rent them. By selling them at a higher rate you should be able to cover your casino party rental fees and some of your other expenses too! Before the event, create framed sponsor signs for each table successfully sponsored. I recommend 6” x 4” because it will fit nicely on any casino table. Then place your ‘sponsor signs’ on each casino table game rented. Please see the example shown in this video. In-Kind is a great hand! If your donors cannot sponsor a casino table game, maybe they can offer you an ‘In-Kind Sponsorship.’ These types of donations can be used for a Chinese, silent or live auction and/or a door prize raffle. Many smaller businesses will donate ‘In-Kind’ items such as gift cards, wine baskets, business services, venue memberships, sporting activities and resort/hotel stays. To begin the donation/sponsorship process start by writing an event donation letter for your team to send out to potential sponsors. It’s a sales process and just like sales does, it requires energy, passion and commitment. Be sure to allow yourself and your team the time they need to obtain those donation commitments. As you move forward and begin to reach your sponsorship goal, be sure to also ask for donations for printing, marketing, food, live music, venue and decorations! You’ll be surprised how quickly things can come together and how easily you can cover all of your expenses with sponsorships! As with any fundraising event an effective strategy is essential and choosing the right casino party company to partner with is critical for a profitable event. 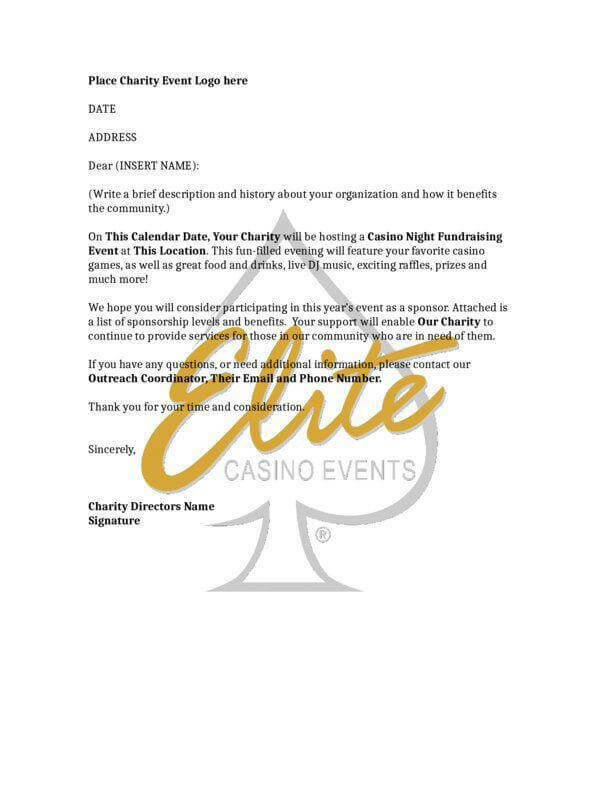 Contact us to request a meeting with your Board about planning your casino night fundraising event. There are many key factors and compliance issues to address pre-event. We’re the experts in this field and we’re more than happy to help you sort through all of them so that…Everybody Wins!